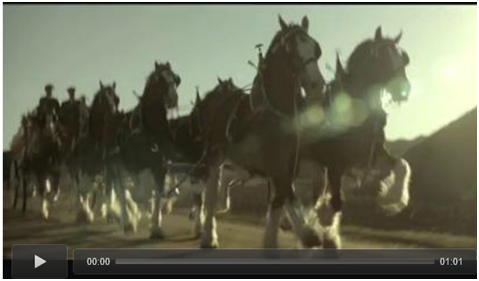 Each February, Anheuser-Busch's Clydesdales get some pricey air time during the Superbowl. This year was no different. 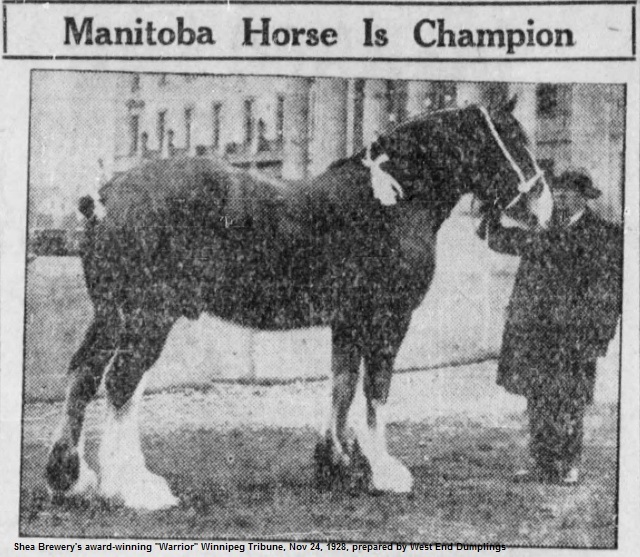 On a couple of occasions I have come across references to the fact that the original Anheuser-Busch Clydesdale teams came from Winnipeg, most recently in the documentary Beer Barons of Winnipeg. I thought I would dig into the story a little further. The story begins in the 1880s with a man named Patrick Shea. He was born in Co. Kerry, Ireland on March 7, 1854 and trained as an engineer. 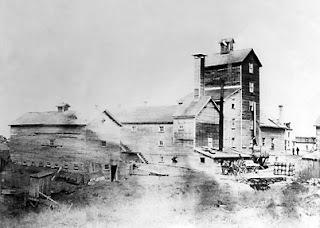 In 1870 he came to North America to work on railway infrastructure projects, eventually settling in Manitoba in 1882. 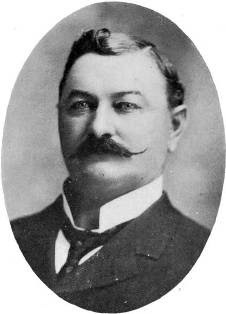 From 1882 to 1884 he was in charge of the water distribution system for the railway construction from Oak Lake westward. When that job was completed, he decided to put down roots in Winnipeg. 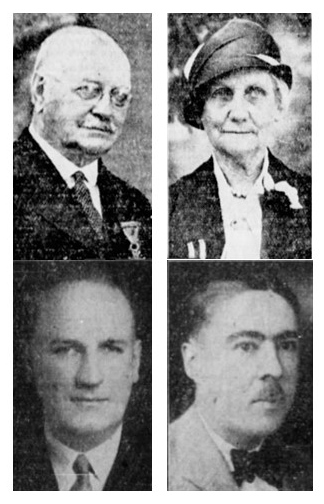 Shea met fellow Irishman John McDonagh and together they purchased the Waverley Hotel near Higgins and Main. They became well know for their hospitality and the hotel and its beverage room became a popular place. He also met and married a young woman named Margaret Burns of Winona, Minnesota. They had five children together, through only one survived childhood. McDonagh died in 1893 leaving Shea the sole owner. 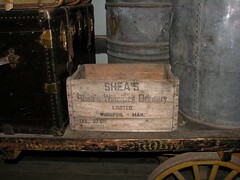 Shea kept the "McDonagh and Shea" business name until 1926 when it the brewery had to be reincorporated due to the province's new liquor production rules. 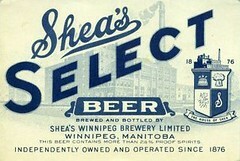 It then became known as "Shea's Winnipeg Brewery Ltd."
Shea became a well-liked community leader and philanthropist. A Tribune story after his death called him "a smiling, kindly, big-hearted boniface." 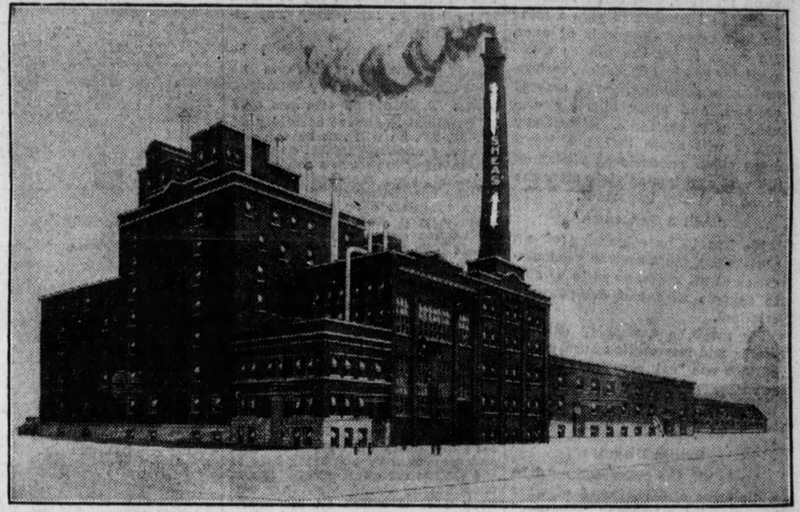 Business was good and in in 1903 the brewery underwent the first of many major expansions at the Colony Street site, eventually becoming the city's largest breweries. The only method of intra-urban transportation at the time, be it for the fire department, streetcars or product delivery, was horse power. Different companies had their preferred breed of horse. Eaton's and Crescent Creamery, for instance, used Hackneys while Manitoba Cartage and Shea's preferred Clydesdales. Horses were a major investment for these companies. There could easily be more horses working for an organization than people, and the amount of space needed to keep and care for them often exceeded the footprint of the building that they served. 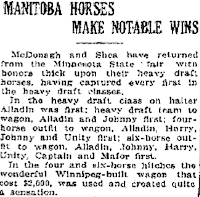 An 1882 Free Press article notes that Manitoba Cartage was building "extensive new stables" for their 42 six-horse teams! Like an imposing edifice, an impressive horse or team was good for their image and public relations. Many companies showed their best in competition and a few of the animals even became celebrities in their own right. Shea spared no expense when it came to this aspect of the company's image. 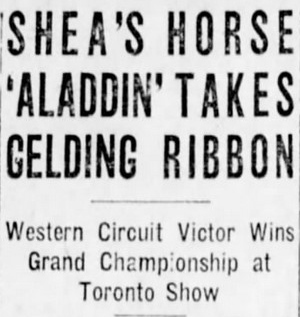 He was an active Clydesdale breeder and regularly imported champion horses directly from Scotland to keep the bloodlines strong.Shea also had special show wagons built at a cost of $2,000 each a piece. 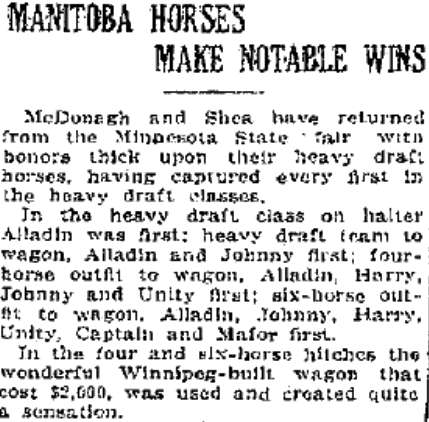 The investment paid off as many of Shea's horses and teams won top prize at Brandon, Toronto, Minneapolis and Chicago. 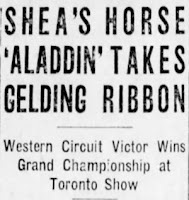 "Aladdin", one of his veterans, took top prize in his class and as overall grand championship at the Chicago International Livestock Show of 1927. At the same show, along with another horse called Unity, Aladdin also won for best team. In the image above, "Warrior" arrived from Scotland in March 1928 and took top honours in his class at Brandon and Toronto. Another Winnipeg firm, Manitoba Cartage, took similar interest in their Clydesdales and before long Manitoba's Clydesdale industry had a stellar international reputation. 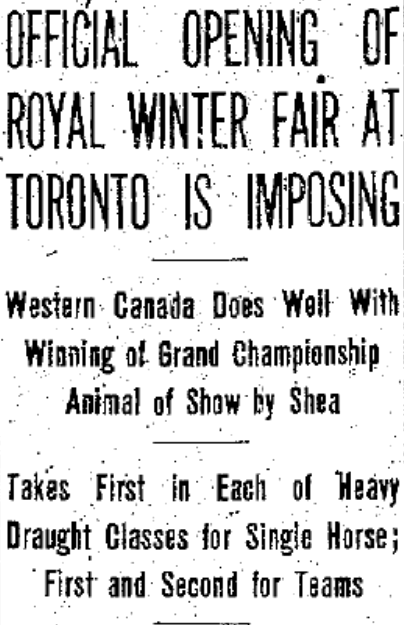 In fact, the Brandon Winter Fair's Clydesdale show was considered one of the best on the continent. After World War I, the era of the horse-drawn wagon was giving way to motorized vehicles and hundreds of horses were being put to pasture each year. 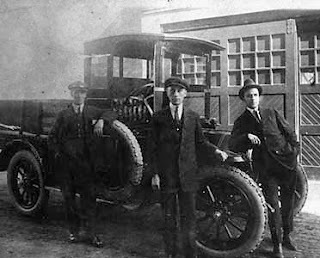 Companies such as Eaton's, Manitoba Cartage and Shea's, though, kept their best teams 'on the payroll' and continued to show them. In the early years of the Depression an aging and ill Patrick Shea decided to sell off his prized teams. He accepted an offer for one of them while they were at the 1933 Toronto Winter Fair in 1933. A brief Free Press story noted that the purchaser was "a St. Louis brewery." That St. Louis brewery was Anheuser-Bush, North America's largest, the brewers of Budweiser. On their Clydesdale web site, (yes they have their own site), it notes: "Realizing the marketing potential of a horse-drawn beer wagon....on April 7, 1933, August A. Busch, Jr. and Adolphus Busch III surprised their father, August A. Busch, Sr., with the gift of a six-horse Clydesdale hitch..."
August Sr. was pleased with the gift and the following year his company purchased more of Shea's Clydesdales at the Royal and Guelph Winter Show. Like Shea before him, he took an active role in their breeding and today their stables boast over 250 Clydesdales. 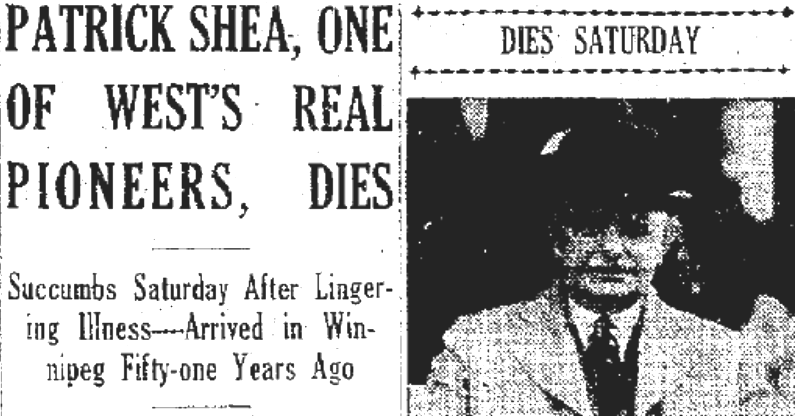 Shea spent most of the early months of 1933 travelling to various U.S. clinics in the hopes to find a cure for what newspapers would only describe as a "lingering illness". 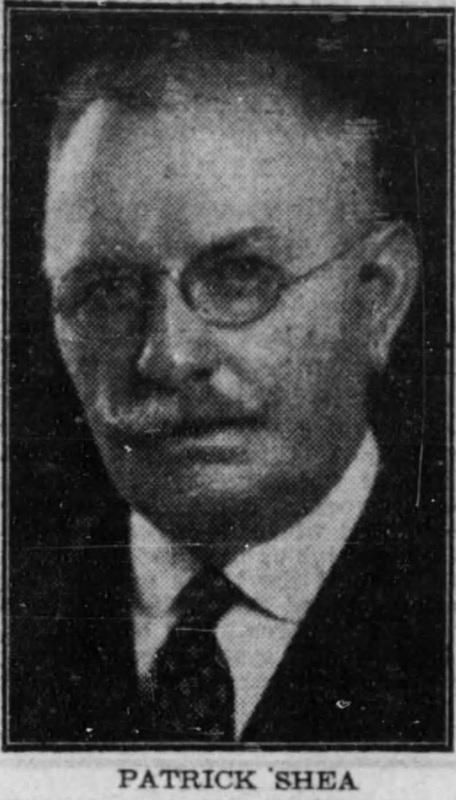 He died at his home at 140 Colony Street on July 8, 1933 at the age of 80. His funeral at St. Mary's Cathedral drew hundreds. Winnipeg beer parlours closed in his honour on the morning of his funeral. The control of the company went to his widow and only surviving child, Frank, who had worked at the company since 1904. Frank became president, though his tenure was extremely short. For some time Frank had been suffering from a "nervous condition", which was usually code for mental illness in those days. (One researcher told me that alcoholism may have been an issue as well.) In early 1932 he had what was described as a severe nervous breakdown and the strain of losing his father worsened matters. At the end of July 1933 Frank was sent to the U.S. and admitted to Johns Hopkins Hospital in Baltimore. He died suddenly at the hospital on October 20, 1933 at the age of 44. This left Margaret Shea the the majority shareholder in the company. By this time, though, Shea's was a mature business with a full executive team and over 100 staff. From 1934 to 1950 the brewery was run by John T. Boyd, a long-time executive who started out as an office boy when the brewery first opened. 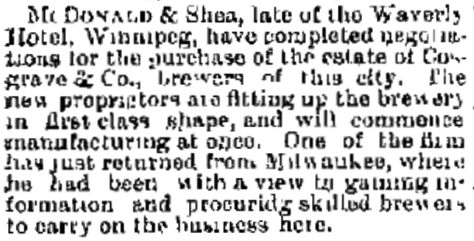 During that time, Shea's assumed control of two other local breweries, Pelissier's and Kiewel's. It also ran the beer distribution firm Brewery Products Ltd. and had a controlling interest in 41 of Manitoba's 260 hotels. When Margaret died, around 1950, she was succeeded by Ethel Shea, Frank's widow. Ethel died in 1952 and left 33,000 shares each to the General Hospital and Misericordia Hospital which put them in the uncomfortable position of being the brewery's largest combined shareholder. When added to the shares owned by the Boyd estate, the three had controlled. 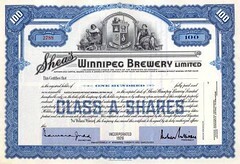 In December 1953 Hugh Labatt announced that his company's offer to purchase was overwhelmingly accepted by Shea shareholders. 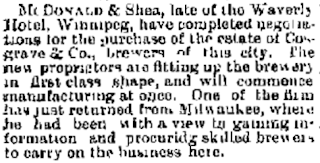 Manitoba's oldest and largest brewery was now in Eastern hands. Each hospital ended up with over $1 million, (about $8.5 m in 2012 dollars). The General put their funds toward a new Children's Hospital in 1956 and Misericorida put theirs towards the construction of their Cornish Wing in 1957. The Shea brewery / Labatt Brewery on Colony Street was closed and torn down in 1979. Also, thanks to beer historian Bill Wright who is writing a book about the history of Manitoba's breweries. Thanks Brent. Interesting stuff. I guess when these breweries started they never figured they'd get as big as they would so they could "borrow" from each other and not have to worry about it ! This is the first that I've heard of the connection - very interesting stuff! Makes one wonder how things might have played out had Shea's kept them and incorporated them into their own marketing the way Busch did. The Clydesdale is an amazing, gentle, huge, gorgeous equine. I just adore them. It is heartbreaking though to see that some, including Budweiser, still mutilate their horses. Why do people still do this brutal, horrific act? They hack off their tails, not just the hair but vertebrae, nerves, muscles and skin. HORRIFYNG!! Uninformed folks think it is to prevent tails from interfering with the harness...it is not. It is just an archaic, pointless, cosmetic mutilation. Thank you for sharing this remarkable local history. Once again you prove yourself a wonderful researcher and writer of local history!! I posted this on the MHS Site previously. It ties into the use of the heavy-horses and the paved Cobble-stone Streets that Winnipeg had at one time...I suspect that the horses used on Fire Wagons would have benefited from this paving-stone/horse-shoe combination as well especially due to the City's notoriously muddy Streets.